Peace comes dropping slow in Northern Ireland. In New York this week, Deputy First Minister Martin McGuinness recalled how just very recently hardline unionist Willie McCrea finally greeted him with a “hello” and recognized his existence—after 30 years or so of sharing the political space, first as enemies, now as government partners. "That shows how the peace process has advanced nowadays," McGuinness said in an interview at our office. Facts on the ground, communities working together, North and South, in ways that would never have been possible during the bad old days. New roads, new hospitals, and new business connections are all cementing the most successful peace process of the modern era. Then of course there was the meeting and handshake between the former IRA commander and the Commander of the British Armed Forces, Queen Elizabeth, in Belfast recently. “Haven’t washed my hand since,” McGuinness joked before getting serious. He told the Queen that he acknowledged the hurt that the death of Lord Mountbatten, her relative and close confidante, who was blown up by the IRA in 1979, had caused her. He didn’t try to slide the Mountbatten issue to one side or to elide the deep harm done in her majesty’s name to generations of nationalists. It was an extraordinary moment he said, one that he had prepared for since the Queen made a major effort during her visit to the Irish Republic last year. The debates in Northern Ireland these days are more likely about water rates than The Troubles. The fact that McGuinness was away from the North during the height of the Orange marching scene sends its own signal of normality. We noted that all was changed, utterly illustrated by the fact that Lennox the dog who was condemned to die hogged the headlines over the July 12th build up. The protestors outside the British and Irish consulates in New York last week were for Lennox, not the IRA, or attacking British perfidy. 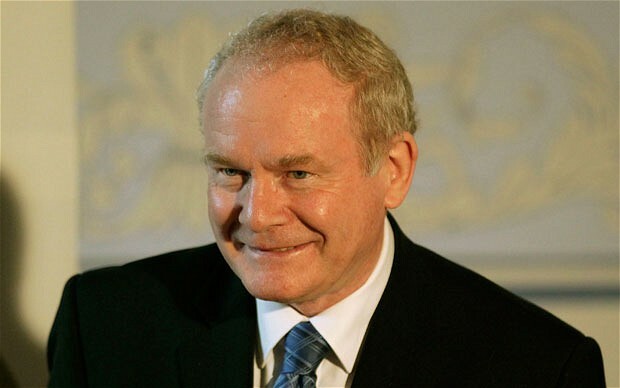 Such is the new Northern Ireland that Martin McGuinness now jointly oversees with Peter Robinson the DUP leader. It is a different landscape where much work needs to be done but the future looks bright indeed. To insiders, McGuinness being greeted by Willie McCrea was every bit as big a deal as shaking hands with the Queen. Peace will continue to fall slowly but surely on the land.